First team members were hired in December 2015. 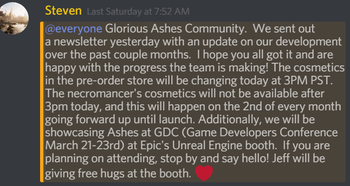 Ashes of Creation development began in February 2016. Official website was launched and project announced, December 10, 2016. Official discord was launched, January 18, 2017. Kickstarter crowdfunding campaign launched with $750,000 funding goal, May 2, 2017. Kickstarter crowdfunding campaign completed with 19,576 backers raising $3,271,809, June 3, 2017. Summer crowdfunding campaign launched, June 21, 2017. Summer crowdfunding campaign completed with 2,485 backers, July 22, 2017. Raised $16,500 for Extra Life children's hospitals, November 4, 2017. PAX West 2017, September 1-4, 2017. Alpha-0 released on schedule, December 15, 2017. Game Developers Conference (GDC) 2018, March 19-23, 2018. 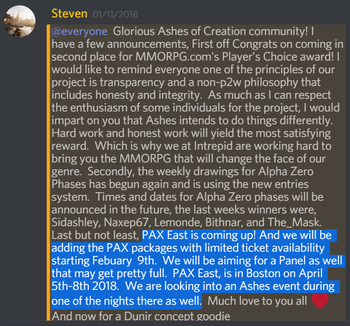 PAX East 2018, April 5-8, 2018. Last day for purchases of Alpha-1 through Intrepid pre-order packs, August 15, 2018. At Gamescom with My.com, August 20, 2018. 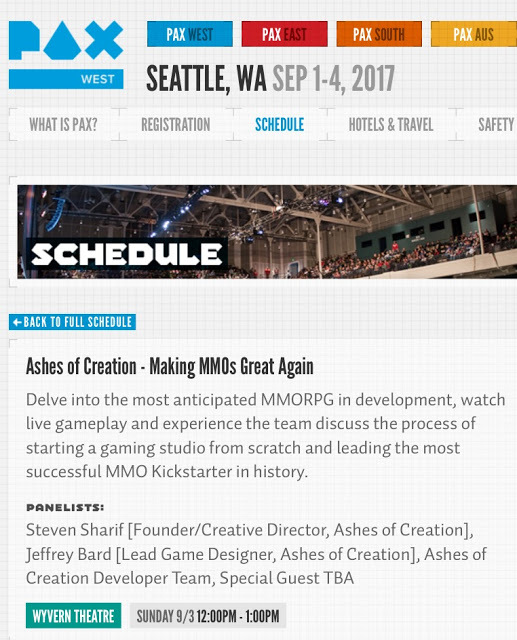 100 developers working on Ashes of Creation, August 27, 2018. PAX West 2018 panel, September 1, 2018. 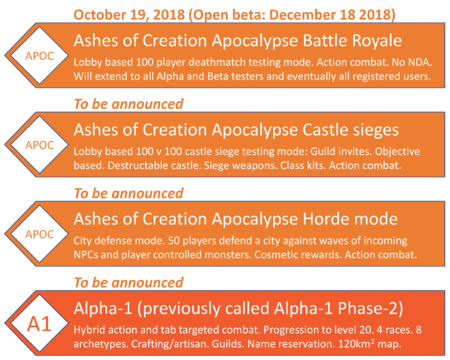 Ashes of Creation Apocalypse battle royale (previously called Alpha-1 phase 1 battlegrounds), October 19, 2018. Raised $20,518 for Rady Children's hospital with Extra Life, November 4, 2018. 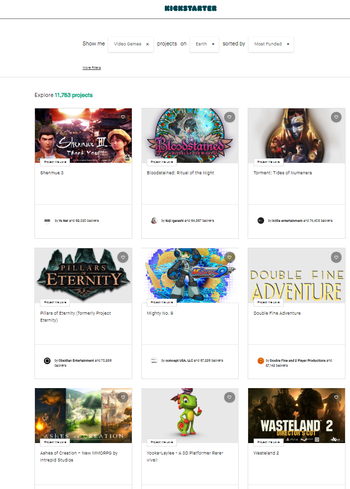 Kickstarter's #7 most funded video game. Most anticipated MMO – MMORPG.com's Best of 2017 Awards. Most anticipated early access hands-on MMORPG – MMOs World. Gamescom 2018: Best Independent game. Gamescom 2018: Best Online game. 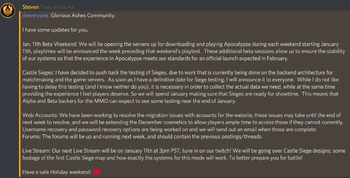 ↑ 1.0 1.1 1.2 MASSIVELY OP interview: Ashes of Creation on a new way to MMO. 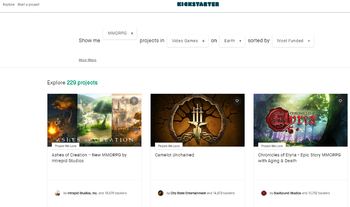 ↑ Ashes of Creation Kickstarter. ↑ Intrepid Studios Dev Team. ↑ PAX West 2017 Schedule. 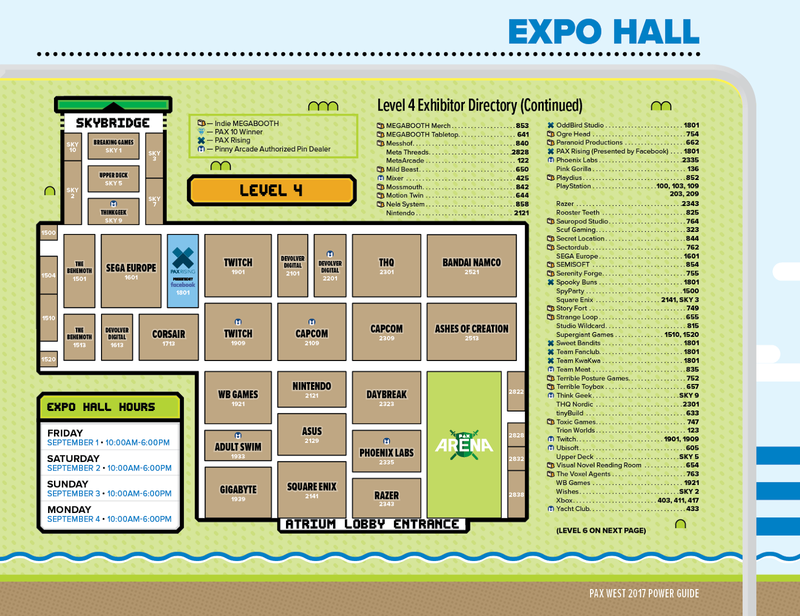 ↑ PAX West 2017 Map. ↑ 10.0 10.1 Livestream, 18 January 2018 (2:48). ↑ Ashes of Creation Gamescom 2018 Interview: Responding to Criticism. ↑ Intrepid Studios Extra Life 2018 (@MediaAoC). ↑ 19.0 19.1 Blog: Creative Director's Letter. ↑ 22.0 22.1 22.2 Livestream, 1 September 2018 (54:06). ↑ 27.0 27.1 Livestream, 8 March 2019 (1:02:45). ↑ 29.0 29.1 Livestream, 8 March 2019 (38:30). ↑ 36.0 36.1 Livestream, 8 May 2017 (11:14). ↑ MMORPG.com's Best of 2017 Awards. ↑ Most Anticipated MMORPGs For 2018. This page's content was last modified on 10 March 2019, at 19:10.